Evaluating Our Importance In The Universe : 13.7: Cosmos And Culture The next time you hear a scientist say something like, "The more we know about the universe, the less important we become," beg to differ: The reality is precisely the opposite, says Marcelo Gleiser. 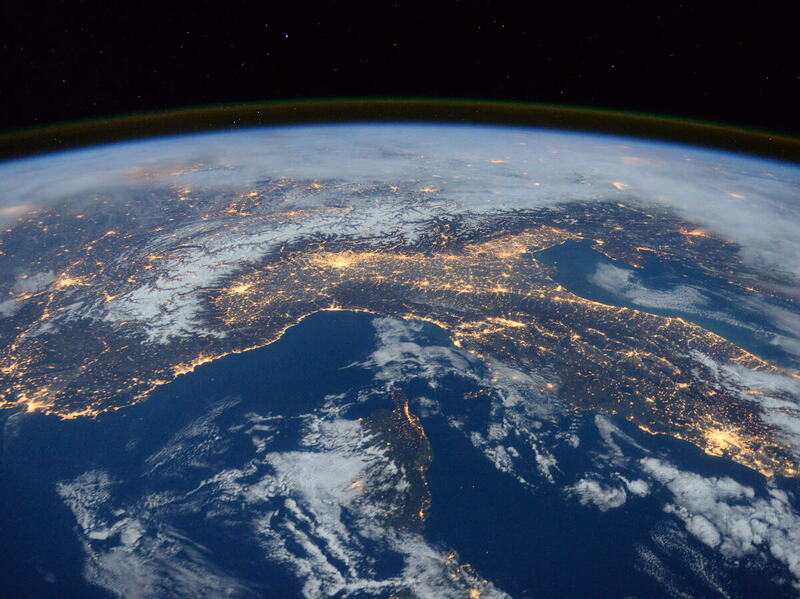 ESA astronaut Tim Peake posted this Jan. 29 photo on his social media channels, commenting: "Beautiful night pass over Italy, Alps and Mediterranean." For the past two weeks we've been exploring some of the questions related to life's origin on Earth and possibly elsewhere. We know life was present on Earth at least 3.5 billion years ago. It may have been present even earlier, but results remain controversial. The window of opportunity for life to emerge and take root here opened after the Late Heavy Bombardment calmed down some 3.9 billion years ago. Before then, conditions were too harsh for living creatures to survive; if anything lived, it was most probably destroyed, leaving no clues. Life's early history is written in rocks. As primal rocks melted and got mixed and remixed in a churning inferno, life's early experiments were erased into oblivion. We can't know what really happened to life that early on. We can study possible metabolic and genetic pathways to life, collect fossilized evidence from old rocks, and conduct experiments in the laboratory, expanding our understanding of this most vexing of questions, the transition from nonlife to life. But even if we are able to make life in vitro, we can't be sure that this is what happened around 3.6 billion years ago here. What we do know is that the history of life in a planet depends on the planet's life history: change the sequence or intensity of events — asteroid collisions, massive volcanic eruptions, radical changes in atmospheric composition — and life's history is rewritten. This casts the question of life here, and elsewhere, into new focus. We can state, with high confidence, that even if there are other intelligent creatures in the universe, even humanoid ones, they won't be like us. We are the only humans in the cosmos, the product of a very particular set of cosmic, geochemical and evolutionary circumstances. Life is an experiment in natural selection, and an amazingly creative one at that. There may be certain biological patterns that offer an evolutionary advantage and would be fairly common, such as two eyes or left-right body symmetry. But details will vary as they do with snowflakes, all coming from the same chemistry but amazingly diverse due to environmental details. As we study the history of life on Earth, we also learn that for approximately 3 billion of the 3.5 billion years it has been around, it consisted of single-celled organisms. The explosive diversity of life we witness now is a recent phenomenon, at least in geological time. To go from nonliving to living chemistry, and then from single-celled to multicellular organisms, such as sponges, many extremely complex steps had to be undertaken. To go from multicellular organisms to dinosaurs and then to mammals and eventually to primates took more complex steps, all resulting from random mutations and selective pressure, all unique and unreproducible. Life should exist elsewhere but, if it does, the probability is that it will be simple, some kind of alien bacteria. Intelligent aliens may be out there in Earth-like planets, or in more exotic environments, but if they are, they are very far away. For all practical purposes, we are alone as intelligent molecular machines capable of pondering our origins and future. This is the striking revelation from modern science, one that should grab everyone's attention. We matter because we are rare and our planet matters because it is unique. At the very least, it should inspire us to re-evaluate our relationship to one another and to the planet, beyond petty ideologies and short-sighted tribal disputes that fill so much of our time. Next time you hear a scientist saying something like "the more we know about the universe the less important we become," beg to differ. The reality is precisely the opposite: The more we know about the universe, the more unique we become. What we do with this knowledge is, of course, a personal choice for each of us. To have this choice is the privilege of being human.